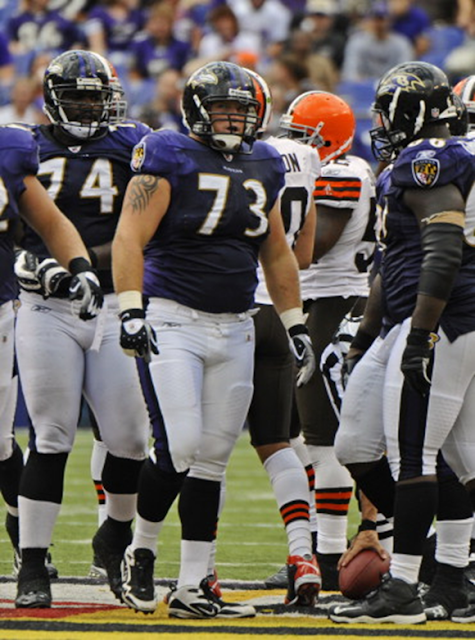 Ravens offensive guard Marshal Yanda (#73) in action against the Browns in the fourth quarter. OWINGS MILLS, Md. – Cedar Rapids native Marshal Yanda was sitting at home in Maryland when he got a telephone call late last month from John Harbaugh, the head coach of the Baltimore Ravens. “I thought he was checking on my ribs,” said Yanda, the right guard for the playoff-bound Ravens. That would seem logical since Yanda, 27, a former standout for Anamosa High and with the Iowa Hawkeyes, has been playing through pain the past few days. But Harbaugh was calling to let Yanda know he had been named to the first Pro Bowl of his NFL career. He joined running back Ray Rice and fullback Vonta Leach as offensive Pro Bowlers with the Ravens, who ranked No. 3 in rushing yards (1,105) in the last seven games of the season. Yanda, in his fifth pro season, was quick to point out that the success of a team helps players get individual honors. “You don’t see too many Pro Bowl players from teams that are 5-11,” he said. The Ravens are far from that type of team. Baltimore was 12-4 in regular-season play this season to win the AFC North title, which gave the Ravens a first-round bye and a home game against Houston on Sunday at noon. Baltimore is 8-0 at home this season. This will be the fourth straight year the Ravens have made the playoffs. “It makes you realize that is not common. To be in the playoffs every year … you don’t take that for granted,” Yanda said. What if the Ravens end up playing the Steelers again? “I would expect another normal Pittsburgh-Baltimore game. It will be two good teams coming at it. I don’t expect anything less,” he said. 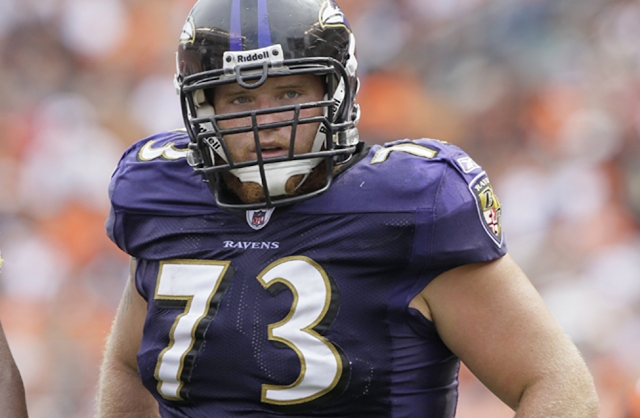 Yanda, a right guard, started all 16 games this season for the Ravens. Last year he started at right tackle in both playoff games as Baltimore totaled 516 total yards, including a team playoff record of 390 yards against the Chiefs in a wild card game Jan. 9, 2011. Yanda was named to the Sports Illustrated (Peter King) All-Pro team in 2010. Now this year the accolades came with his first selection to the Pro Bowl, which will be held Jan. 29 in Hawaii. Due to thigh and rib contusions it did not look like Yanda would play in Week 17 in the regular-season finale at Cincinnati. The Ravens had clinched a playoff berth but had not locked down a first-round bye going into the finale, which was a 24-16 win against the Bengals. He had a big block on the fourth play of the game against the Bengals that allowed Rice to go 70 yards for a touchdown. “I fell on my rib late in the fourth quarter. I was in a lot of pain. Everyone wanted to give me a hug (after the game). I told them to get away,” he said, with a big laugh. David Akers' four field goals and Andy Lee's five soaring punts were mere appetizers in the 49ers' season-opening victory. The best was yet to come, both in terms of a playoff-bound season and that game. Ted Ginn Jr. blazed two trails to the end zone in the fourth quarter, returning a kickoff 102 yards and a punt 55 yards for touchdowns to seal a 33-17 win over the Seattle Seahawks. With that Sept. 11 opener, the 49ers served notice that defense wouldn't be this team's only trademark unit. Special teams -- what coordinator Brad Seely terms the "dirty work" -- would also be a dominant force en route to the NFC West title and a No. 2 seed for the NFC playoffs. "We give it the importance that it deserves," coach Jim Harbaugh said the day after the victorious debut. 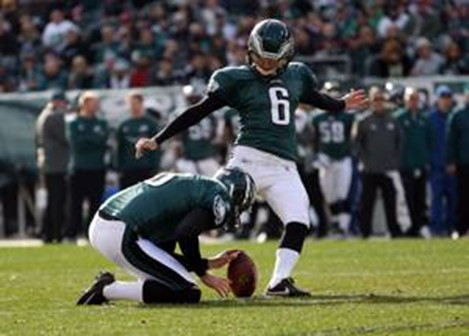 All that practice made for the perfect demise of several records: Akers set league marks by a kicker with 44 field goals and 166 points, and Lee had the best net average ever at 44.0 yards per punt. When Jim Harbaugh joined the Indianapolis Colts as their quarterback in 1994, he heard positive reviews of their former special teams coordinator, Seely, who had assumed the same role with the New York Jets. Seely went on to win three Super Bowl titles as the New England Patriots' special teams coordinator from 1999-2008, and now he's helped put the 49ers three wins shy of the Lombardi Trophy. Nicknamed "The Professor" by long snapper Brian Jennings for his installation of detail-oriented schemes, Seely is in his 23rd NFL season. His consistent, straightforward approach has won over players. "You have to subvert your singular wants for the good of the team. That's what special teams are," Seely said in October, in his only interview this season with 49ers beat writers. Since his arrival in 2000 as a seventh-round draft pick, Jennings has forged a fabulous career thanks to his steady snapping skills. He wants every field-goal snap to look like a replay, and he's mastered that craft so well that Harbaugh called Jennings "a Jedi Knight of snapping the football." 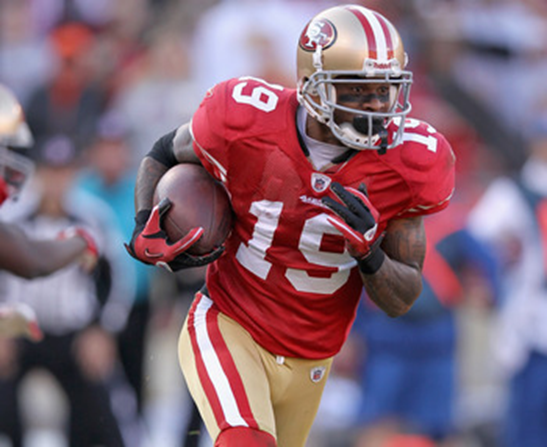 The longest-tenured 49er, Jennings' expertise is balanced with a sense of humor and clever wit. Not many NFL long snappers have their own radio show, nor have many shaved their eyebrows during the season. No one other than Jennings has snapped a ball to a 49ers punter or holder since the turn of the century, and that includes the otherwise meaningless fourth quarters of exhibition finales. Perhaps no other player has a better bond with Harbaugh, who said: "We've had discussions on Genghis Khan to Patton. I try to take time out of my day to make sure I get a little piece of Brian Jennings as much as possible." If anyone can define the all-out mentality of the special teams unit, it's Costanzo, a fifth-year player whose underdog career has relied upon his fiery style after kickoffs and punts. "We fight to the ball every time to make a play," Costanzo said. "We have a lot of guys who take it seriously. Guys are willing to give every inch of their soul for the team." Guys such as C.J. Spillman, Tavares Gooden, Larry Grant, Anthony Dixon, Bruce Miller and Colin Jones. But Costanzo is the special teams' leading tackler, and his hustle is as evident as the colorful, NBA socks he wears daily. A New Jersey native, he went undrafted out of Lafayette College in 2006. But he latched onto the New York Jets, headed to NFL Europe's Rhein Fire and then the Buffalo Bills. He blossomed the previous two seasons with the Browns under Seely, who's otherwise called "Blake's dad," as Spillman quipped. "If I was a fan of football, I'd be a fan of Blake Costanzo," Seely said. By setting an NFL record with a net average of 44.0 yards per punt, Lee earned a Pro Bowl invitation and first-team Associated Press All-Pro honors. His right leg has been a bona fide weapon as the 49ers have ruled the field-position battle. But don't forget about his hands. Since 2007, no 49er other than Lee has attempted a punt or served as holder on a field-goal attempt or point-after kick. That amounts to the football hitting his hands 756 times. "Andy's so much fun to work with because he has great hands and is an athletic guy," Jennings said. Lee also was a superstitious guy until this season. While he's opted to rely more on his religious faith, he also has welcomed astute guidance from Seely and a growing familiarity with Jennings, who knows exactly what side of Lee's body to deliver a snap when the 49ers opt for directional punting. A year ago on the playoff stage, Akers inadvertently began his cross-country journey from Philadelphia to San Francisco. Akers missed two field goals in the Eagles' 21-16 wild-card loss to the Green Bay Packers, spelling the end of his 12-year tenure in Philly. The 49ers needed a replacement for retiring kicker Joe Nedney, and Akers wrestled with the decision to move his family from South Jersey to a rental house in Pleasanton. But Akers liked the 49ers' alluring presence of Harbaugh, Seely, Jennings, Lee and even Alex Smith, whose uncle, John L. Smith, coached at Akers' alma mater, the University of Louisville. His finances ruined by a Ponzi scheme -- Akers testified about that to a Texas grand jury during training camp -- he signed a three-year contract and became the 49ers' biggest offseason acquisition. Their offense sputtered enough times for Akers to set NFL records by a kicker with 166 points and 44 field goals in 52 attempts. "We wanted the best guy," Harbaugh said of courting Akers last summer. "That was our first guy that we wanted to talk to, and I know he had other options." Before the season, Ginn took a pay cut. His salary reportedly got slashed from $2.2 million to $1 million. He responded in valiant fashion, clinching the season-opening win over Seattle with two fourth-quarter returns for touchdowns. No one before in 49ers history had returned a kickoff and punt for touchdowns in the same game, much less in the same minute. Ginn pulled off that feat with a 102-kickoff return and 55-yard punt return. Not bad for a guy who hadn't won the kickoff-return job over rookie Kendall Hunter until the eve of the opener. Ginn didn't take back any of his other 28 kickoff returns for a touchdown this regular season. But his average of 27.6 yards per return ranked third in the NFL behind the New York Jets' Joe McKnight (31.6 yards) and the Green Bay Packers' Randall Cobb (27.7). Aside from kickoffs, Ginn also proved clutch on punt returns, but not only because of the league's fourth-best average of 12.3 yards per return. Ginn has not fumbled this season, not on any kickoff returns, punt returns or his 19 receptions. Receivers: Calvin Johnson, Detroit; Victor Cruz, New York Giants. Very tough to leave off Wes Welker, who won the receptions crown by 22 catches, but Cruz was just so dominant late in the year. Offensive line: LT, Joe Thomas, Cleveland. LG, Carl Nicks, New Orleans. C, Scott Wells, Green Bay. 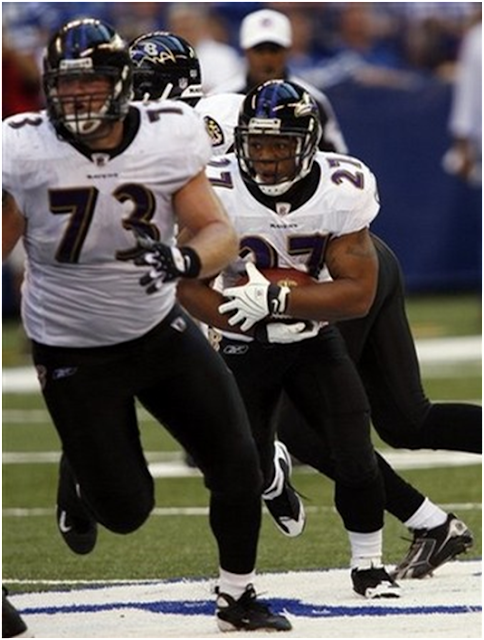 RG, Marshal Yanda, Baltimore. RT, Eric Winston, Houston. Brian Waters of New England was close at guard, but I love the year Yanda had, and how he played so well in pain late. Tight end: Rob Gronkowski, New England. As great as Jimmy Graham was this year, Gronkowski's one of the best all-around tight ends to come into the league in decades. Quarterback: Aaron Rodgers, Green Bay. Stunning that Rodgers got 47.5 of the 50 votes, as good as Drew Brees has been. Running back: Maurice Jones-Drew, Jacksonville. When your foes know you're the only even remote offensive threat on the team, and you win the rushing title by 242 yards, that's impressive. (I'm supposed to name two backs, which I never do. The AP wants two, and I've explained for years if you have two backs and two receivers, how fair is that? Fullback: Vonta Leach, Baltimore. A human anvil. Defensive line: Jared Allen, Minnesota, and Justin Smith, San Francisco (ends); Haloti Ngata, Baltimore, and Sione Pouha, Jets (tackles). Smith played outside, or end, on four-fifths of the snaps he played this year, so I can't figure out why he'd be listed as a tackle. Linebackers: Tamba Hali, Kansas City, and DeMarcus Ware, Dallas (outside); Derrick Johnson, Kansas City, and NaVorro Bowman, San Francisco (inside). So many good players here, and I feel terrible for not including Terrell Suggs, who could have placed at either end or OLB. He's ferocious. Hali and Ware were special too, especially the day Hali terrorized Rodgers in Green Bay's only loss of the year. Secondary: Darrelle Revis, New York Jets, and Johnathan Joseph, Houston (corners); Eric Weddle, San Diego (free safety) and Kam Chancellor, Seattle (strong safety). Joseph was a big reason the Texans improved drastically, and Weddle became a premier roaming safety this season. K: David Akers, San Francisco ... P: Andy Lee, San Francisco ... Return: Patrick Peterson, Arizona. Akers set the field-goal record. Lee had the highest gross plus net averages. Peterson had four return TDs. MVP: Aaron Rodgers, Green Bay. See last week's column for reason. Off. player: Drew Brees, New Orleans. Not a copout. The best stat season ever by a quarterback deserves this. Def. player: Justin Smith, San Francisco. Tape-watchers marvel how he never takes a play off. Watch how he caught Jeremy Maclin from 15 yards behind to clinch the Philly game in Week 3. Off. rookie: Cam Newton, Carolina. Best season a rookie's ever had, I'd say. Def. rookie: Von Miller, Denver. Slowed by bum thumb late. Edges Aldon Smith. Coach: Jim Harbaugh, San Francisco. Great candidates this year. Only one premier one. Assistant coach: Wade Phillips, Houston. Took the 30th-ranked defense of 2010, lost Mario Williams early, and turned it into second-ranked D.
Comeback: D'Qwell Jackson, LB, Cleveland. Missed the last 26 games with two separate pectoral tears. This year, led the AFC in tackles. Executive: Mike Brown, Cincinnati. Good draft netted long-term weaponry. Good trade raked Raiders over coals for Carson Palmer. From Aaron Wilson's "Suggs' big play helps Ravens hold on for win"
YANDA RETURNS: Pro Bowl offensive guard Marshal Yanda played through a lot of pain, starting and playing the entire game despite bruised ribs that prevented him from practicing most of the week. Yanda delivered the key block on running back Ray Rice’s 70-yard touchdown run in the first quarter, bashing into middle linebacker Rey Maualuga. Yanda had trouble breathing normally as late as Friday and was listed as doubtful on the injury report. Yanda’s grit didn’t go unnoticed. The first-round playoff bye is especially meaningful for injured players like Yanda to recuperate. From Don Delco's "Browns can't capitalize on Steelers' mistakes"
DAWSON DOES IT AGAIN: For the fourth time this season, all the points in one game were off the right foot of Phil Dawson. 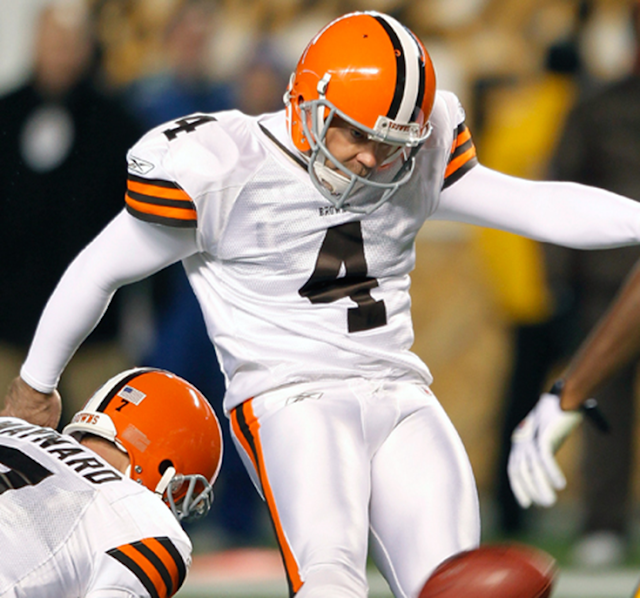 Dawson kicked a 26-, 45- and 49-yarder in the swirling winds at Cleveland Browns Stadium. "Today was a really tough day," Dawson said. "The wind, the temperature, the wet and the field, it was the perfect storm. You have to either use (the weather) to your advantage or let it sink you. I had to make a decision several years ago to figure out how to make it my advantage and kick well here." Dawson finished the season 24-for-29 on field goals, 20-for-20 on extra points and, most notably, 7-for-8 from more than 50 yards. "I gave my heart and soul to this team this year," Dawson said. "I feel pretty good about it." Entering this season, Dawson was given the Browns' franchise tag and he signed a one-year tender for about $3.25 million. He will become an unrestricted free agent this offseason. After the game, Phil Dawson mentioned he wasn't sure if he'd be back. There are a lot of Browns who should wonder about their futures here, but not Dawson. As he said, "I really missed only one kick all year." So true, as the others were victimized by bad snaps or blocking breakdowns. He is more than the team's MVP, he has been the one good thing about the Browns since the day they returned in 1999. Others came and went, but Dawson kept kicking field goals through the swirling wind on the lakefront. There is still one game left on the Titans schedule, but since we are at the end of 2011 it’s not too early to go ahead and hand out team superlatives for this season. As the Titans head into the New Year with at least some gasp of playoff life remaining, Mike Munchak’s first season as a head coach has to be deemed a success. Yes, there have been disappointments – losses to Jacksonville and Indianapolis, as well as coughing up a 10-point lead at home against Cincinnati. If the Titans had won those three games they would have a one-game lead over the Texans headed into this week’s finale in Houston. A playoff spot would already have been secured. As it is, the playoff scenarios will all be sorted out this weekend. Still, there is enough of a body of work to hand out various honors, as well as a few prizes for less-than-stellar work. Most Valuable Player: Quarterback Matt Hasselbeck. Yes, Hasselbeck’s play has been erratic, but his demeanor has not. Hasselbeck has solidified the quarterback position in a way that was desperately needed. A quarterback has to be a leader, and Hasselbeck is one. Vince Young never was, and Kerry Collins wasn’t vocal enough as a part-time starter to really lead. Not only is Hasselbeck showing leadership, he is mentoring Jake Locker to eventually be the team leader as well. Runner-up: Receiver Nate Washington. Offensive Player of the Year: Washington. No player has improved his game more than Washington this season. He has shattered his previous career high for receptions, becoming the first Titans player to catch 70 passes in a season since Derrick Mason and Drew Bennett both did it in 2004. Washington also has a chance to become Tennessee’s first 1,000-yard receiver since that year as well, if he can pick up 69 more receiving yards in the finale at Houston. Runner-up: Receiver Kenny Britt. 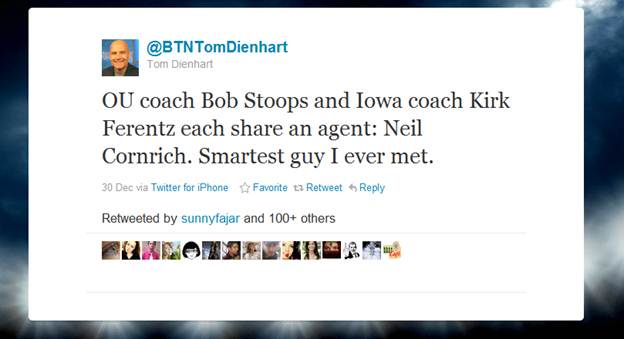 Britt was hurt three games in but, before that, was on his way to being dynamic as the go-to receiver. Defensive Player of the Year: Cornerback Jason McCourty. He leads the team with 93 tackles, second on the team behind Jordan Babineaux, and is tied with Michael Griffin for the team lead in interceptions.. In fact, on Griffin’s interception Saturday against Jacksonville, came on a McCourty deflection. Runner-up: Linebacker Colin McCarthy. The fourth-round pick made an immediate impact and even earned Defensive Player of the Week in the AFC for his two forced fumbles and fumble recovery against Buffalo. Had he started all year, he would have won this award. Rookie of the Year: DT Karl Klug. This is a tough call because of so many rookie contributions. 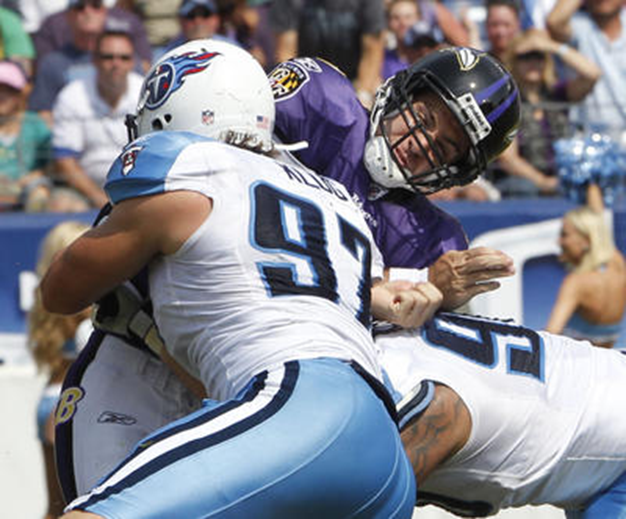 The Titans thought Klug would be part of their defensive end rotation. He instead he ended up being one of their best defensive tackles with a team-high seven sacks. Not bad for a fifth-round draft choice. Runner-up: McCarthy. As stated earlier, McCarthy did extremely well after getting his shot, and looks to have solidified the middle linebacker spot for several years to come. Special Teams Award: Kicker Rob Bironas, who was solid again this season, hitting 26 of 29 attempts thus far, including six of seven from beyond 50 yards. It’s somewhat hard to understand why he didn’t make the Pro Bowl. Runner-up: Cornerback Tommie Campbell. Yes, Campbell has had some bouts with immaturity and penalties, but other than the penalties in Indianapolis he has been solid as a gunner on special teams. His kickoff return against Tampa Bay was amazing. Most Improved: Wide receiver Lavelle Hawkins. Coming in, “Hawk” had a whopping 19 catches over three seasons. He frustrated quarterbacks and offensive coordinators with his inability to run precise routes. But when Britt went down, Hawkins stepped in with 44 receptions as the third receiver. Runner-up: Tight end Jared Cook. Cook might have gotten the nod for this award if not for the fact that there were games where he completely disappeared, including Buffalo and New Orleans (no receptions). Biggest Disappointment: Running back Chris Johnson. This should come as no surprise, given the expectations that came following a holdout and a $53 million extension. Johnson still needs 14 more yards to reach 1,000, quite a fall given that he had 2,006 just two years ago. Runner-up: Safety Michael Griffin. With Jerry Gray coming on board as defensive coordinator, and Griffin in a contract year, big things were expected from the free safety who has shown enough flashes to be a Pro Bowler three years ago. But it hasn’t happened. Griffin has been run over on tackles by Michael Turner and failed to break up a pass play for a big gain that cost the Titans in the opener against the Jaguars.